We invite you to join us for a wonderful evening in support of the Earth Treasure Vase Global Healing Project and our peace building efforts in Liberia on Saturday, September 17, 2011 at 6:00 pm. 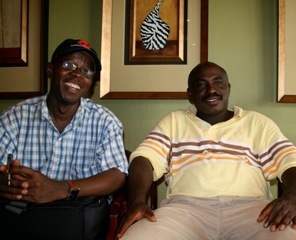 We will be joined by special guests, ex-combatant rebel general Christian Bethelson and former refugee William “Uncle Jake” Jacobs, who will share remarkable stories of stories of courage and inspiration regarding their work in Liberia with ex-child soldiers and former combatants to transform the wounds of war and build peace. Please RSVP to Alliance for the Earth at info@EarthTreasureVase.org by September 10th. For more info call 505.986.9232, or contact info@EarthTreasureVase.org. Download the Benefit Invitation here. This entry was posted on Wednesday, August 31st, 2011 at 6:51 pm	and is filed under News. You can follow any responses to this entry through the RSS 2.0 feed. You can trackback from your own site.